This mysterious species was discovered in 1860 by botanists Dr. Berthold Seemann and Jacob Storck on the Fijian island of Taveuni. In Seeman's "Flora Vitiensis", published in 1865, it was described as a low-growing shrub with pink flowers. Jacob Storck, a German, settled in Fiji and kept a collection of plants from this archipelago. In 1963, an American botanist, Ross Gast, traveled to Fiji but found no trace of Hibiscus storkii, which has since been declared extinct in the wild. 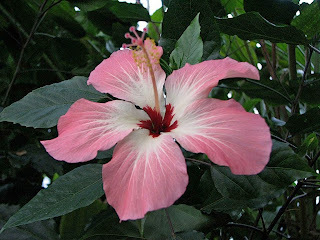 Fortunately, Jacob Storck distributed some of his specimens, and it is believed (by some) that this gorgeous hibiscus survived in several collections of various botanical gardens in Europe as well as Australia. There are still doubts however concerning this species authenticity —some botanists maintaining that it is simply a form of Hibiscus rosa-sinensis. In 1941, Skovsted theorized that Hibiscus storckii, is actually a primitive form of Hibiscus rosa-sinensis (A. Skovsted, a Danish cytologist, made a chromosome count of the species which is reported in "Chromosome Atlas of Flowering Plants" by Darlington and Wiley). To further muddy the waters, some claim that another elusive species, Hibiscus denisonii is actually the same as Hibiscus storckii. Whatever the case, the plant we label today as Hibiscus storckii has definite ornamental value. Historical Reference: H. (Ketmia) Storckii. Nomen vernac -Sequelu. Somosomo, Island of Taviuni, growing as underwood like the allied Hibiscus Genevii, Bojer; rare. This is closely allied to Hibiscus rosa-sinensis, but I think sufficiently distinct to entitle it to the rank of species. Unfortunately my specimens are not so complete as could be wished, and so prevent a thorough comparison with its nearest ally. I have never seen it cultivated; it is a more straggling shrub than H. rosa-sinensis. The leaves are always more elliptical and less deeply cut on the margin, the segments of the calyx are also somewhat differently shaped, and I have never observed a variety of H. rosa-sinensis with such fine pink-coloured petals. I have named it in honour of my able assistant, Mr. J. Storck, who was with me when we first found it.